Permanent Makeup by Susan was established in 1993 as the leading permanent makeup practice in Central Oregon. As one of the first state licensed technicians and recently appointed to the Board of Oregon Health Licensing Rules Advisory Committee, Susan Gruber combines the eye of an artist with a meticulous attention to detail to provide the best possible results. She takes time to fully understand both the needs and wishes of her clients. Susan works with Central Oregon doctors dealing with patients needing scar camouflaging and post-surgical esthetics needs. She also trained nurses at the Santa Barbara Plastic Surgery Center in advanced areola repigmentation for breast cancer survivors and permanent makeup basics. She is Certified through the Society of Permanent Cosmetics Professionals..
How comfortable & safe is it? Is this the thing for me? 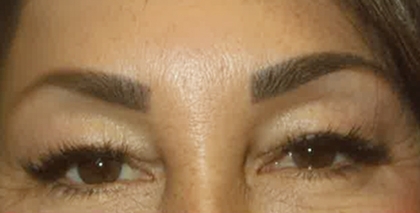 Permanent makeup is a cosmetic technique which employs permanent pigmentation of the dermis as a means of producing designs that resemble makeup, such as eyelining and other permanent enhancing colors to the skin of the face, lips, and eyelids. If you answered" yes" to any of the above, Permanent Makeup could be just what you are looking for. You will be surprised and pleased with what Permanent Makeup can do for you. Add shape and hair strokes to a sparse brow for a more natural look or shade color for full definition. Define natural lip line, correct asymmetry and faded lip borders. More defined, fuller lips with color fill. Soft color in lashes for a natural looking enhancement or a thick, more dramatic liner look. Correction work is one of my specialties! All corrections and design work are priced by evaluation, and a consultation is necessary. Touch up not included with color refresh. Color refresh for correction on another professionals work will be full price. When I correct someone else's work it is usually with color and shape. The commitment to quality permanent makeup designs are unsurpassed. I strive to meet and exceed the clients expectations. ALL PROCEDURE FEES INCLUDE A COMPLIMENTARY PERFECTION VISIT FOR UP TO FOUR MONTHS FOLLOWING THE INITIAL TREATMENT. If, after the completion on both visits, there is anything about the agreed upon design that is not to my clients’ satisfaction, an additional appointment will be arranged for more perfecting within the four month period from the time of the initial procedure….NO QUESTIONS ASKED. Permanent cosmetics last a long time, but not forever. As you become accustomed to your new makeup it's not uncommon to want more definition or more color. You will want to freshen up your look every couple of years. The darker the original color, the longer it will remain unchanged. Lighter, natural, delicate colors are often times more vulnerable to the effects of sun and chlorine, and breakdown by the body's natural responses over time. I like the natural look. Can permanent makeup be done so I look great without looking overdone? Absolutely! The most requested style of makeup is enhancement of the natural facial features. The objective of these procedures is to raise self esteem, self-confidence, and allow for a more active lifestyle. The natural look also allows you to apply normal cosmetics over your permanent makeup for color variety or for a more dramatic look if desired. Usually, each procedure appointment is one to two hours. The majority of the time is spent in selecting the appropriate color for your skin, and in measuring and artistically drawing on the planned procedure prior to actually implanting the color. Adequate time is allowed for topical anesthetic to make you completely comfortable. You will also be given thorough aftercare instructions for optimum healing and outcome. Unlike many technicians that sterilize and re-use needles and casings, Permanent Makeup by Susan uses all pre-packaged, sterile, and disposable, needles and needle casings. Any parts that actually touch the client, along with the medical grade needles that penetrate the skin are all pre-sterilized from the manufacturer. This ensures that you will receive the safest, most sterile form of cosmetic tattooing available. In addition, all of your procedures are done under Federal OSHA standards that regulate the sterile, safe, and healthy practices for prevention of cross-contamination from person to person. You may experience minor swelling and redness on procedure day. You may resume normal activities immediately except that you will be advised to wear no makeup directly on the treated area for about one week. The amount of redness, healing, and peeling that occurs during the first week is dependent upon on the procedure that is done. I am nervous about it BEING permanent. How can I know what to expect before I have it done? Makeup pencils are used in advance for your approval. I am always cautious to keep on the side of light and natural, for more color can always be added later during your follow-up visit. This procedure can mimic the appearance of hair in the brow. Anyone who desires fullness or definition to their eyebrows will benefit from permanent eyebrows. From a few strokes, to filling small areas, to total brow recreation, you can have the freedom of never using an eyebrow pencil again. Click for the EyeBROW Before and After Gallery to view photos, read testimonials and more! A subtle natural look mimicking hundreds of tiny eyelashes is achieved by implantation of pigment in the lash line. From a soft, natural-looking enhancement to a more defined line, the choice is yours! Permanent eyeliner can be applied in your choice of styles and colors. Whatever look you choose, you will wake up, shower, exercise, work, swim and go to bed always looking your best. Click for the Eyeliner Before and After Gallery to view photos, read testimonials and more! Lip liner can be applied to give more definition, change the size and shape of the lip, or add fullness to the mouth. It helps prevent lipstick from bleeding - or forget the lipstick altogether and add full lip color! Full lip color can be applied in a soft pinkish/red, similar to the lip color of a baby, and is popular for those looking for a natural look. Wear it alone or apply different shades of lipstick over your permanent lip color. Click for the LIP Before and After Gallery to view photos, read testimonials and more!